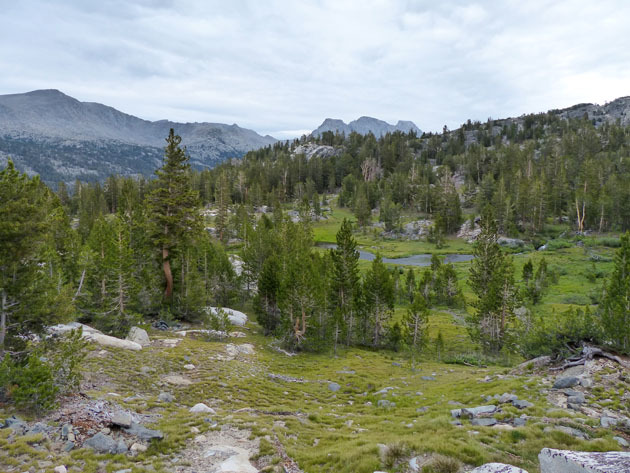 From the bridge over the San Joaquin River at the junction of the John Muir Trail and the Piute Trail, one can see picturesque Emerald Peak rising above the hustle and bustle of the JMT, promising isolation, quiet, and alpine views. Richard Stover and I were not disappointed. Emerald Peak was named by Theodore S. Solomons and Ernest C. Bonner in July 1895 according to Peter Browning in Place Names of the Sierra Nevada. Aptly named as it turns out. The Peak is dotted with green rocks containing copper, although thankfully not of high enough quality to make mining the ore worthwhile so far from roads and markets. Richard and I left Santa Cruz Wednesday morning and arrived at Florence Lake in time to catch the last ferry of the day at 4:30 p.m. The Lake is so low this year the normal landing is high and dry. The ferry owners have set up a "yellow brick road" for folks to follow after they disembark so they can find the trailhead. After the short boat ride, we hiked a bit and set up camp on Alder Creek. The next morning we resumed our travel after drying out from the thunder storm which dumped rain on us until 7 a.m. We passed the Muir Ranch where through hikers resupply and soon were on the John Muir Trail. 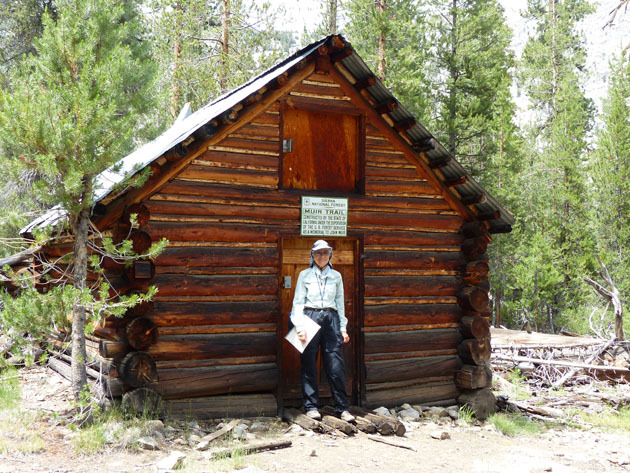 Shortly after we passed the John Muir Trail Cabin, a structure built by the State of California in cooperation with the National Forest to honor John Muir. The cabin is only about 70 feet to the south of the trail and quite visible if one looks about. 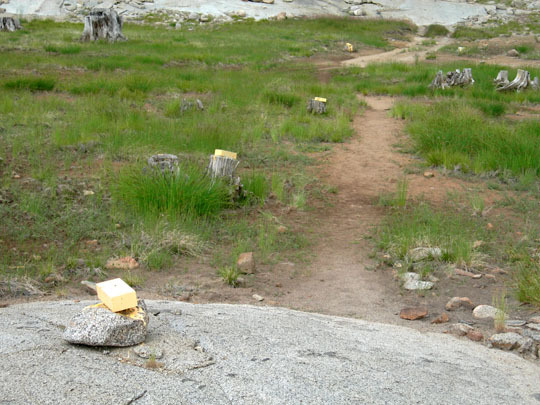 I wondered how many intense JMT/PCT hikers see it as they hurry by. So I decided to conduct a poll. Over the course of our backpack I queried hikers who had passed the cabin. To mask the intent of my research, I asked them how far it was to the cabin, not if they had seen it. My hypothesis was that most through hikers are too busy looking at their feet to see not only the cabin, but all the beautiful meadows, rocks, birds, and wildlife around them. I was not wrong. Of 15 hikers queried, not one had seen the cabin although all had passed by it. 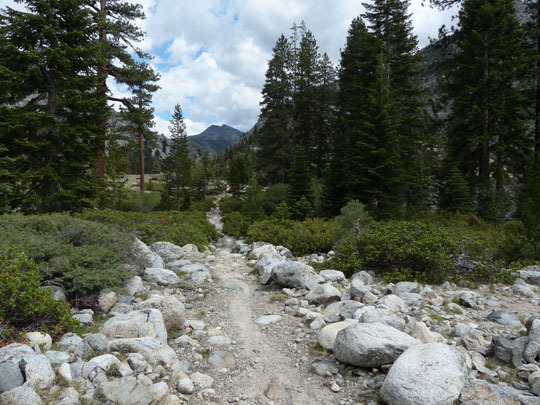 The John Muir Trail might be better called the John Muir Highway. It seems a new hiker or group goes by every 15 minutes or so. 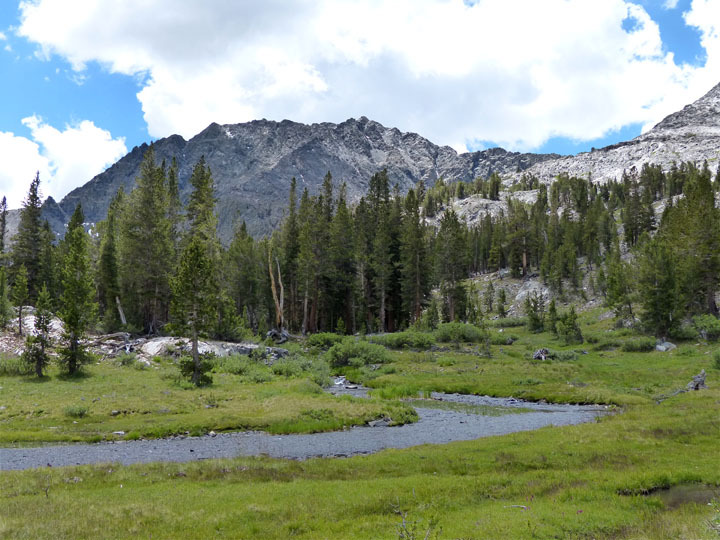 In early July there are a lot of Pacific Crest Trail hikers heading north and an equal number of John Muir Trail hikers headed south for Mount Whitney. Most are in a powerful hurry and don't want to stop to talk. Ask north bound hikers where they are coming from and the answer is "Mexico." That night we camped hidden from the trail above Aspen Meadow. Since it had rained again during the night, we delayed our morning departure so our tent could dry out. Then on past the entrance to Goddard Canyon and up 1000 feet to Evolution Meadow. 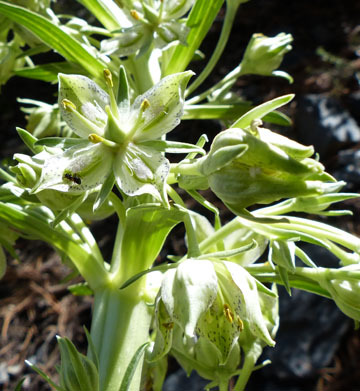 As we climbed, we saw a flower we had never seen before, the unusual Monument Plant standing at least three feet high and sporting greenish-white flowers. When we reached the ford across Evolution Creek, instead of crossing, we climbed the south slope up another 1000 feet off trail to our base camp on a bench above the creek which drains Lake 10,554 ("Emerald Lake"). 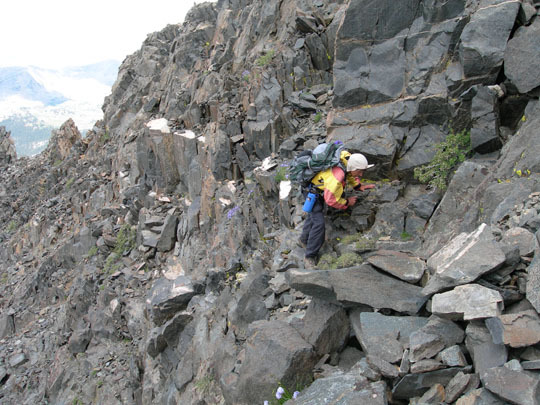 By following the trees we avoided talus and glacier-polished slabs on the steep slope. What a fabulous campsite! From our tent we could see Darwin and Mendel to the east, Mt Goethe to the northeast, and the flower-filled meadow and creek immediately below. I set up a tarp as a rain shelter as we had another shower as soon as our tent was up. The next day, July 4, we rested up, enjoyed more showers, and unintentionally fed a few mosquitoes. Here, high above the trail we saw no one else for three days. 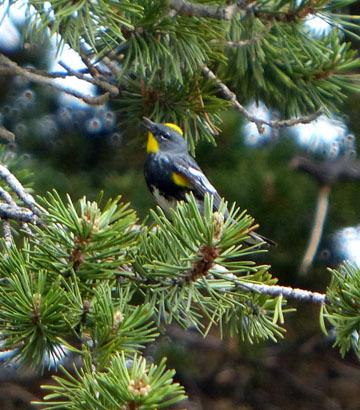 We watched deer, a yellow-rumped warbler, some white-breasted nuthatches, Clark's nutcrackers and many species of flowers. Happy birthday, USA! On July 5 we left camp at 6:30 a.m. and circled around the pyramid (11,786) above our camp, then traversed at about 10,900 feet to the broad gully on Emerald's west face. 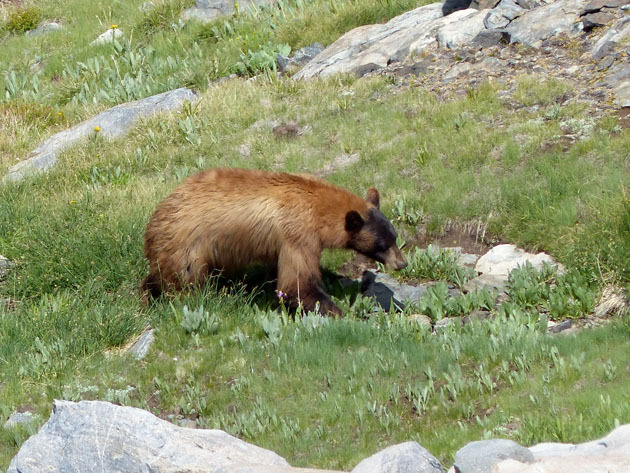 We started up the gully at 10 a.m., marveling that we had seen a young bear eating what appeared to be shooting star foliage at 11,000 feet. I have never seen a bear so high although I have read occasional accounts of their being at altitude. Remarkably we saw some white sky pilot, a high altitude flower that is usually blue. We should have exited the gully on the right (south) after the second tower. If we had, we would have ascended the easier nose. Instead we managed to get into some third class rock, somewhat unnerving on this unstable pile of loose rubble. There were funnels ready to slide and rockfall waiting to happen. The rock was unstable, but amazing to look at with its embedded geodes, scattered crystals, and occasional bright green stones. 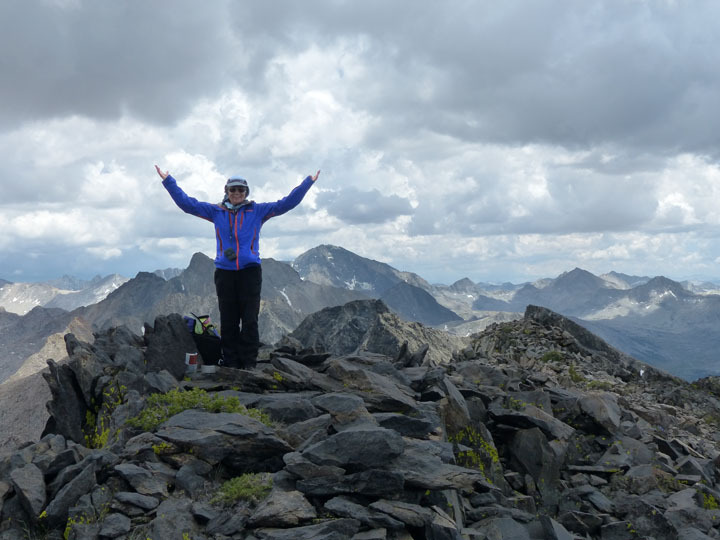 After ascending 1300 feet of loose rock in the gully, we reached the north ridge. From there it was an easy few hundred feet to the summit and its spectacular view. Dark, massive Mt. Goddard rose up to the south. Red Mountain shouted its name to the west and the Glacier Divide dominated the northern horizon. To the east Mt. Mendel and Mt. Darwin loomed skyward. Emerald Peak is rarely climbed. In the register I saw the names of old friends. We were the first party to climb this peak in 2015. Only a few people had climbed Emerald in 2014. On the descent we took the nose toward Goddard Canyon, then reentered the gully where we should have exited on the way up, finding a way after a few back tracks to avoid cliffs. By then it was approaching 6 p.m. I was getting tired and cranky from the crummy rock. We stopped and rested, ate some food, and had some ibuprofen. Just name a body part, and I can tell you it hurt. We had been going for 12 hours. We finally got back to camp at 9:40 p.m. by headlamp too tired to eat supper. We'll deal with food tomorrow. The next morning we celebrated by making a pot of tea and serving Newman's O's for breakfast. We picked the right day to climb Emerald. It rained again that afternoon, snowing above 13,500 feet. We took it easy and recovered. The adventures never stop. On July 7 we hiked back down to Evolution Creek. 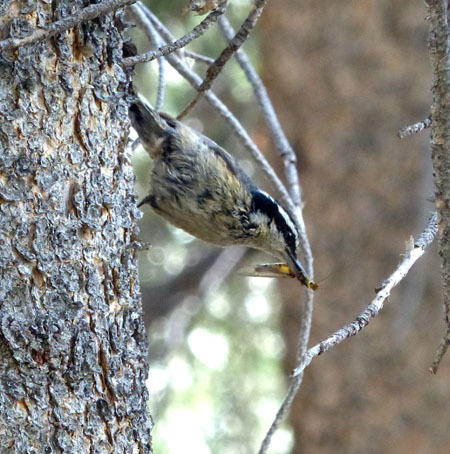 That afternoon we stopped for a snack and spotted a red-breasted nuthatch with a bug in its mouth. My daughter, Suzie, has taught me that birds travelling with food are usually feeding babies. And so they were. We watched and photographed for an hour as the parents brought bug after bug into a hole in a nearby tree. What a treat to watch! Finally on July 8 we reached Blayney Hot Springs. Besides soaking our tired bones, we got a front row seat to watch a Mountain Quail, likely trying to lure us away from her chicks. She put on quite a show tossing her head to shake the long plume. At the hot springs we met Janet, from New York who had injured her knee and was unable to continue on the JMT to Whitney. We offered to drive her to Fresno the next day and subsequently met Carter, a recent high school graduate from Ohio who was also stranded with ankle problems. Stuffing four people and four backpacks into our little Honda worked, and we all eventually got home safe and sound by way of Fresno.